Moving to a far flung part of the world is an exciting but somewhat nerve-racking adventure. That’s why many who choose to do so turn to the likes of John Mason International for reassurance that the whole process is going to run like clockwork. Many removals companies – including John Mason International – request full customer payment prior to a move. This isn’t at all unusual, in fact it’s pretty standard practice. That’s why it’s so important to entrust your big move to the right team of professionals. How do you know if you’ve picked the right removals company? Well one sure-fire way getting it right is to look for industry accreditation – like that offered by the British Association of Removers. Being a BAR member says a lot about a company because it means being part of a initiative dedicated to promoting excellence in the removals industry. It also offers movers a great deal of protection. 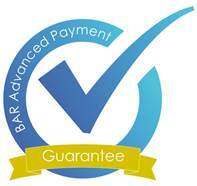 The BAR Advanced Payment Guarantee scheme safeguards the pre-payment requested by many removals specialists. In the unfortunate event the BAR member company were to fail financially before completing a move, any money paid in advance is completely safe and will be refunded. Every cash, BACS and debit card payment is protected on all private residential removal and storage contracts concluded in the UK. John Mason International enjoys a long and successful history, and all of us who are part of its large team of professionals fully expect a strong and prosperous future. That said, we understand those who are embarking on one of the biggest challenges of their lives – moving from the UK to another country many miles away – deserve the strong reassur-ance the BAR Advanced Payment Guarantee scheme provides. We are fully-fledged members of this important industry association, and that means those we move can forget any concerns about payments and concentrate on anticipating their exciting new life abroad. With an array of removals and relocations companies to choose from, BAR membership is a very strong indication of a company’s commitment to its customers.They are the reason for our success – and they deserve complete and absolute protection.